It is important to remember that batteries do not produce electricity, just store and shift it. On the other hand, solar produces electricity. The electricity can be used to power your household, and export to the grid. While many complain that feed-in-tariffs (10-15 c/kWh) are much less than what you pay for electricity (25-35 c/kWh), they still present a good return for your excess solar. Just on feed-in-tariffs alone, once can expect 8-12% ROI (annual savings/revenue divided by cost of solar installation). We used to pay around $1,600 per year for electricity. With solar, we were earning around $110 per month in feed-in-tariffs, more than covering the cost of our remaining grid electricity usage, resulting in running at around $700 per year profit. With current high feed-in-tariffs, it is a good time to go big on your solar now to payback a good portion of your system in the next few years. This could even mean getting 10kW of solar or more. It is important to have a good idea of how much solar you are producing, how much electricity your house is using and when, and how much solar you are using directly (ie. self consumption). 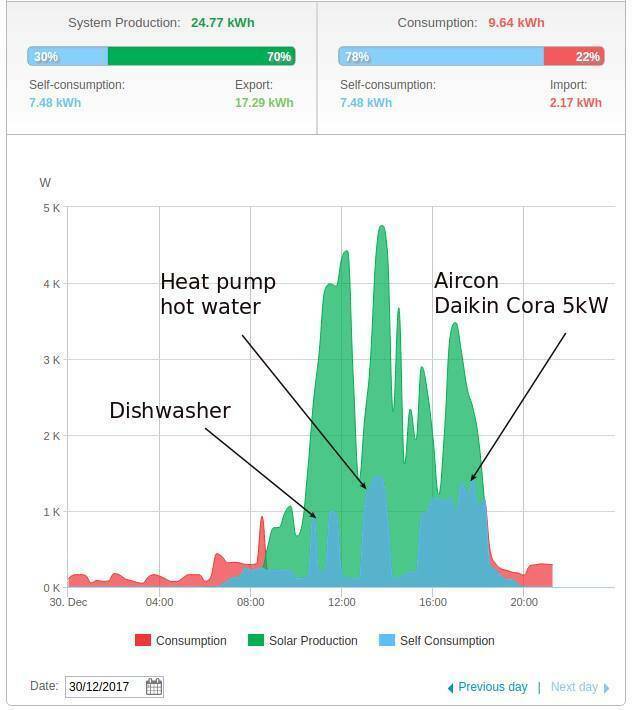 Prior to getting a battery, we had shifted loads like hot water heat pump, dish washer and washing machine into solar production times to maximise our solar production. This saw us being 65% solar supplied! And only using 2-4 kWh per day from the grid. So we knew that getting a 9.3kWh battery was a bit overkill for what we needed. But at least we knew. Without consumption monitoring, we wouldn’t have been in tune with our electricity demand and solar production to become 65% solar supplied, and would not have known what size battery we needed or if we needed one at all. Like many shire households, we used to have a resistive element hot water tank for out hot water. It was on a controlled load, and produced hot water overnight. We found that it was using 8 kWh per day. This was around half of our daily electricity use! We now have a hot water heat pump. This is efficient and uses 2 kWh per day on average. When we got solar, we moved our heat pump production for overnight, to come on at 1pm each day. For watching our consumption monitoring, it is powered by solar for pretty much all of the year. Basically, we are using solar to make our hot water in the middle of the day, then using the hot water when needed. It is effectively an 8 kWh battery. A new hot water heat pump and tank costs between $2,500 and $4,500 installed, much cheaper than a Tesla Powerwall or LG. Other than a heat pump, you could also use a timer to make your hot water system to make hot water during the day, or use a PV Diverter to power your hot water with solar (around $1,000). We use lights predominantly at night. If you get a battery, it is wasteful to use up the battery capacity using inefficient lighting. It may mean that you get a bigger (more expensive) battery, or you leave less battery capacity available for back up or other purposes. Efficient lighting like LEDs can use 80-90% less than older lighting technologies. It is now possible to meet all your household energy demands efficiently using electricity. This may mean a heat pump for hot water, electric induction stove tops and ovens and efficient reverse cycled air conditioning for heating in winter. This means no more gas bill, and in particular, now more gas connection fixed fees. This saving on gas bills can help your payback on a battery. And even more, you can reach 100% solar supplied! Rather than investing in a huge or multiple batteries, see what efficiency improvements can be made around heating, cooking and other uses, and see through your consumption monitoring what best battery may suit. If would like to find out more about how to go all electric efficiently, the My Efficient Electric Home Facebook Group is a great place to get info, hear from others and ask questions. This article is by Jonathan Prendergast, founder of the volunteer-run Sutherland Shire Community Energy initiative (and website) Sunny Shire. He also contributes to My Efficient Electric Home Facebook group – a popular and active forum for Australians seeking to improve energy use in their homes. It was reproduced here, via Solar Choice, with his permission.